There is power in Being fully present in the shoes you have on your feet at this moment in time. BE fully present in the moment you are in. You never know who or what you will encounter that may shift your life dramatically. When I launched my business, I signed my first big client during a conversation in a Starbucks line in California and he was from Texas! Go figure! When I flew from Maine to CA for a meeting, I had no idea this would happen. I simply started a friendly conversation being curious about what brought this person to CA while in line. I learned very early in my life to show up, BE and do my best no matter where I was or what I was doing. I grew up on a farm which meant I could be driving a tractor in the field, picking rocks out of the field so they wouldn’t harm the potatoes as they grew, shoveling dirt off the potato house floor or going to the bank with my Dad. No matter what, it was an essential job and it needed to be done. During this time of my life, I learned when I showed up with the energy of my first description, I felt sad, lonely, and discouraged and when I came to work bringing my “A” game, I felt on fire and I could do anything! I quickly decided I much prefer feeling like Super Woman! Continuing to carry this lesson with me over the years, I have witnessed that Being my best self has presented me with countless and unexpected opportunities in life. Today’s writing was inspired by a conversation I had with a young woman a couple of months ago. When I shook her hand and asked her, “What do you do?” she hung her head and replied, “Well, I’m just a bartender...right now.” Her shoulders were drooped and her face appeared out of energy. We continued to chat and she described to me how she feels at work and it sounded a lot like the “I don’t give a ($$%#)*$ attitude.” I asked her how she felt and her description was sad and discouraged. She shared with me she has a degree in marketing yet has no experience; therefore, no one will hire her. I invited her to imagine what she could do to market the drink special of the day to her current customers and her eyes began to twinkle. She came up with some fun ideas. Yes, they made me want to buy one! Then I asked her, what do you think might happen if you showed up with this energy and one of your customers happens to be looking for a person to do some marketing for them? All of a sudden it clicked! She tapped into the possibilities in front of her every time she went to work. She decided to give it a try. She put on her bartending shoes with a new zest and energy to show up Being and doing her best. Guess what? Within two weeks she was asked to do some marketing for the bar where she works! Her energy shifted and she was able to create what she was seeking. I believe the opportunities in life are endless. It is my job to show up doing the best with what I currently have where I am and be open to what is possible. This has opened many unexpected doors for me to walk through which has always lead to the next exciting leg of my journey through life. 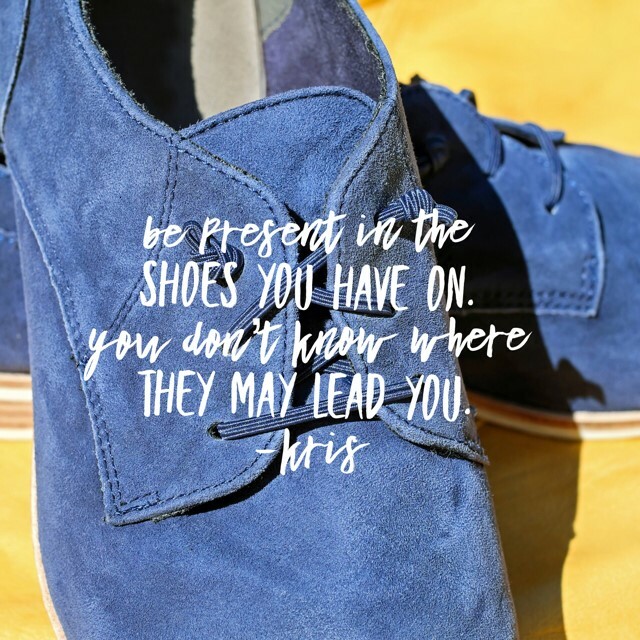 What would happen in your life if you were to embrace the shoes you are currently in? I invite you to try Being fully present wherever you are in your life today. Shift your energy and bring your “A” game with you. Notice how different you feel and what happens around you. If you would like to chat more about how to become more present in your life either at work or at home, click here to book a discovery session with me today.